Today is leap day, the additional calendar marking in February that comes around every four years. So far in this leap year, the markets are making their own kind of leap — namely a very bullish leap of faith. In 2012, investors have placed their bets that the worst is over in Europe, and that the economy now is finally on the upswing. The result has been a solid surge in stocks that has taken the S&P 500 Index to its highest point since May 2008. It also pushed the Dow Jones Industrial Average above the psychologically significant 13,000 mark. Of course, the Dow had fallen back below the 13,000 mark as I wrote today’s alert for you. On the global front, the year also has been a good one for the equities. If we examine the chart below of the Vanguard Total World Stock ETF (VT) — a fund pegged to the price and yield performance of the FTSE Global All Cap Index — we see that this broad measure of the global markets continues trading well above its short- and long-term moving averages. VT is up 9.2% year-to-date through Feb. 28, and that’s not too shabby for the first two months of the year. Right now, there are two schools of thought about what might happen next — the bull camp and the bear camp. The bull camp argues that we are headed toward Dow 14,000 very soon. These are the bulls that cite the slight improvement in a few economic data points as proof that we’re on the right track, and that it’s only a matter of time before the fundamentals in the economy catch up to the optimism being displayed on Wall Street. The bear camp argues that stock prices are completely at odds with reality, and that this rally ultimately is doomed to failure. 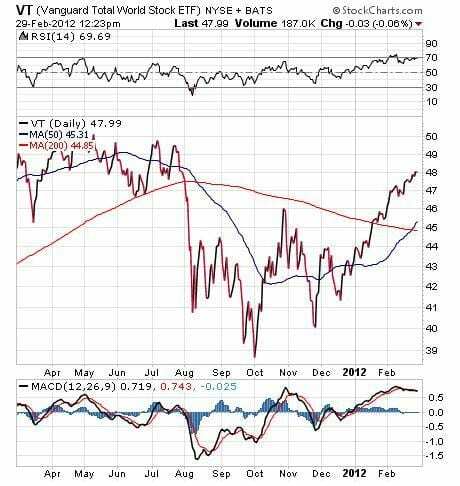 The bears say the fundamentals of the world economy do not support this bullish 2012 run. They cite as evidence the fact that Europe’s debt woes are just starting to bloom, and that China’s economic growth continues to slow. Then we have those perniciously high oil and gasoline prices, which are bound to lead to a contraction in economic activity going forward. Well, if you haven’t guessed it already, I am in the bear camp here. In fact, I think this rally is more faith-based than it is reason-based. Once the reality sets in that things still are tough all over, I think we’re likely to see a significant contraction in equity prices. If you’re long this market here, then be sure you have stop-loss orders in place to protect your gains. When the pullback comes, it’s going to be fast and furious, and you don’t want to get caught with your long positions unprotected. There’s no denying that the stock market is flashing bullish signs, but what about the bond market? Shouldn’t bond prices fall and bond yields rise in a bullish equity environment? Historically, when stock prices surge, bond prices fall and bond yields rise. This time around, however, stock prices are rising along with bond prices. Put another way, stock prices are surging, while bond yields are falling. In the chart below, we see the price action in the S&P 500 vs. 10-year Treasury bond yields. 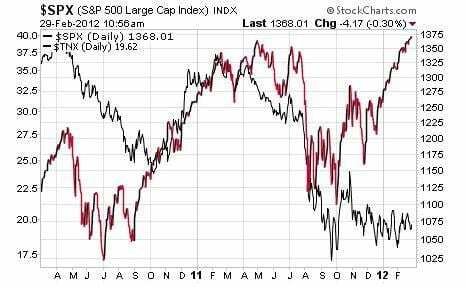 As you can see, since November 2011, stocks have been in an uptrend while bond yields have fallen. The divergence here tells us a couple of important things. First, it shows us that money is flowing into both stocks and bonds in search of something more than the yield offered by cash. Thank Federal Reserve Chairman Ben Benanke and his colleagues for the fact that cash is paying virtually nothing, as his near-zero interest rate policy is partly responsible for pushing investors into riskier assets in the quest for a decent return on their money. The second thing the rise in stocks and the dip in bond yields tells us is that stocks are screaming bull, while bonds are screaming bear. That’s because when things get dicey, money usually flows away from equities and into the relative safety of Treasury bonds. That bond buying pushes yields lower. Something has to give here, as stock investors and bond investors aren’t likely to continue betting on a divergent path for much longer. Which way will things go? Well, I think you know the camp where I’ve pitched my tent. We all wonder what’s ahead for us. When it comes to investing, we essentially are trying to predict where the market will go next. Yet the future is unknown, and largely out of our hands. That’s why I love this quote from Dr. Diamandis, because it shows us that the best way to make the future what we want it to be is to do that which is under our control — and that means creating it ourselves. After flirting with the 13,000 level over the course of the last few weeks, the Dow Jones Industrial Average finally closed above that psychologically important mark for the first time since May 2008. The Dow now has staged a 22% rebound since early October, and its 6.4% gain for 2012 marks the strongest beginning to a year since 1998. The Dow would need to rise just 8.9% to return to the record 14,164.53 hit on October 9, 2007.